Zernike coefficients and other numeric data can be imported from OPD Scan II, OPD Scan III and OPD-Station Software in an 'eye by eye', 'examination by examination' process. First you have to call up the desired examination within the OPD Scan or OPD Station software. Zernike coefficients will only be exported if at least one of the maps displays Wavefront data. We suggest to generate an own map layout for the export to Datagraph-med. As an example the image below shows such a layout from OPD Scan III. 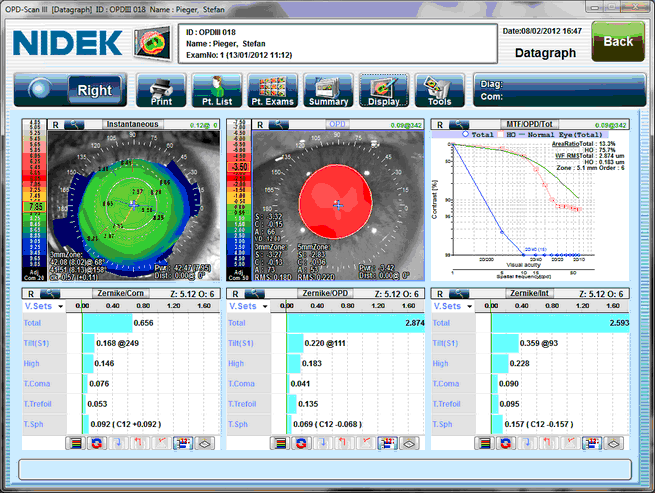 It contains topographi, entire eye and internal zernike data as well as a totol MTF graph. To start the export of numberical data click on 'Tools' and 'Data Output'. then select 'Text Data' and the folder in which you want to have the data saved. 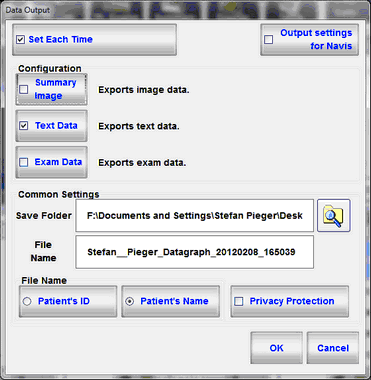 From within Datagraph-med go to the same patient - select the 'Aberrations' tab and enter the follow up month for which you want to import the Zernike data. Then make sure 'Nidek OPD Scan' is selected and click on 'import coefficients for selected follow up' button. You will see a file select box - allowing you to navigate to the location where you stored the OPD-Scan export data. Select the file to be imported. If you receive the following warning make sure you have the correct file selected. We recommend to delete the files after importing them in order to avoid confusion. After the import you should see all coefficients as well as MTF data on the aberration tab. Repeat the above for the next examination you want to import. You may export more than one examination from the OPD Scan or OPD Station software at a time. But you will have to follow a certain protocol in order to identify the examinations in the import window correctly.